Figure 1. Constantin Wild displays a unique 290 carat multicolored gem suite. Photo by Duncan Pay/GIA. 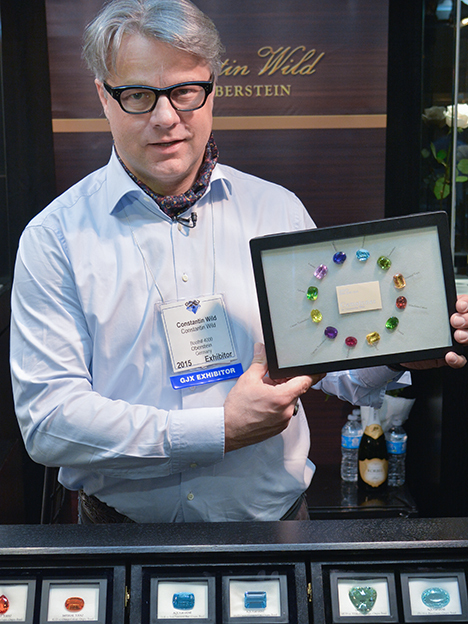 At GJX, Constantin Wild (W. Constantin Wild & Co., Idar-Oberstein, Germany) showed us a remarkable multicolored suite composed of 12 gems from all over the world. The total weight was 290 carats, with each gem weighing approximately 25 ct and measuring 19–20 mm. The suite included aquamarine and an unheated purple copper-bearing tourmaline from Mozambique; rubellite, yellow beryl, green tourmaline, and Imperial topaz from Brazil; peridot and kunzite from Pakistan; mandarin (spessartine) garnet from Nigeria; tanzanite from Tanzania; green sphene from Sri Lanka; and “canary” tourmaline from Zambia (figure 1). In this video, Idar-Oberstein’s Constantin Wild showcases a unique 290 ct multicolored suite of specimen-quality gems from all over the world, rare “canary” tourmaline from Zambia, fine rubellite from Brazil and Nigeria, and an array of sets aimed at enterprising jewelry designers and manufacturers. Wild specifically highlighted canary tourmaline (figure 2). He remarked that its intensity of color is reminiscent of Paraíba tourmaline. Found intermittently in the 1980s and marketed since the early 2000s, this typically yellow-green material is rich in manganese (up to 9.18 wt.% MnO). Wild had two significant oval-cut gems of 19.83 and 26.18 ct, both unheated. For more information on this unique gem, see www.gia.edu/gems-gemology/winter-2007-yellow-tourmaline-zambia-laurs. 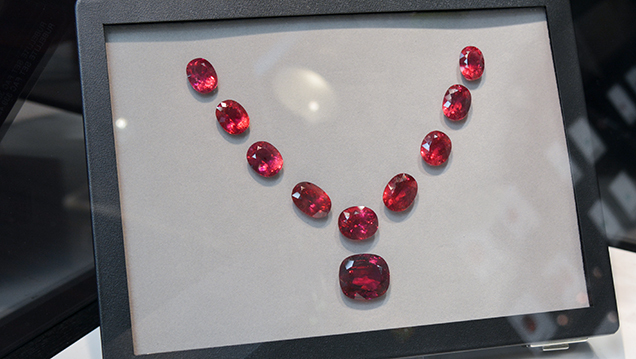 Another standout at Wild’s booth was a superb suite of rubellite tourmaline totaling 339.42 carats (figure 3). Wild called it a suite “from two continents,” as it contained both South American and African gems. The suite featured a spectacular cushion-cut 77.16 ct Nigerian rubellite centerpiece from new production, measuring 28.30 × 24.87 mm, framed by nine perfectly matched Brazilian rubellites from previous inventory weighing 262.26 carats. Figure 2. 26.18 ct and 19.83 ct “canary” tourmalines from Zambia. Photos by Duncan Pay/GIA; courtesy of Constantin Wild. Besides his higher-end single gems and suites, Wild also displayed some mixed-color sets, which he described as more “fashion-oriented” combinations (figure 4). Intended as concepts for jewelry designers, they included color combinations such as opal with pink tourmaline and morganite beryl with red tourmaline, tanzanite, tsavorite, and treated blue topaz, along with more unusual arrangements: demantoid and “Mali” garnet with fire opal, or yellow beryl and mandarin garnet. Figure 3. This superb 339.42 carat suite of 10 rubellite tourmalines contains Brazilian gems with a Nigerian center stone. The gems in the suite range from 39.61 to 77.16 carats (center stone). Photo by Duncan Pay/GIA; courtesy of Constantin Wild. Another trend was the use of facet-grade rough for cabochons. These were often of large size and superb color. Of particular note were a 104.83 ct tanzanite and a 140.95 ct kunzite spodumene (figure 5). Figure 4. 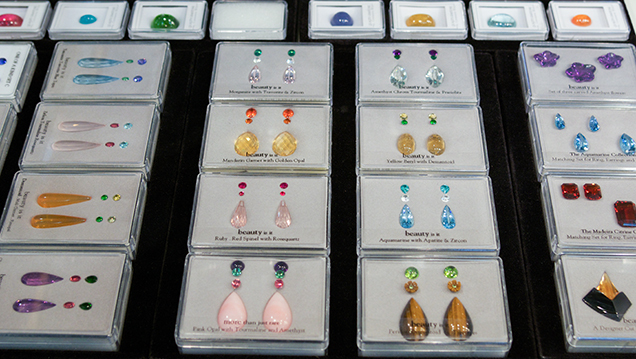 Constantin Wild’s selection of mixed-color sets for jewelry designers included some interesting combinations. Photo by Duncan Pay/GIA; courtesy of Constantin Wild. Duncan Pay is the editor-in-chief of Gems & Gemology. Explore tanzanite history, research, quality factors, and more in the GIA Gem Encyclopedia. Explore kunzite history, research, quality factors, and more in the GIA Gem Encyclopedia.